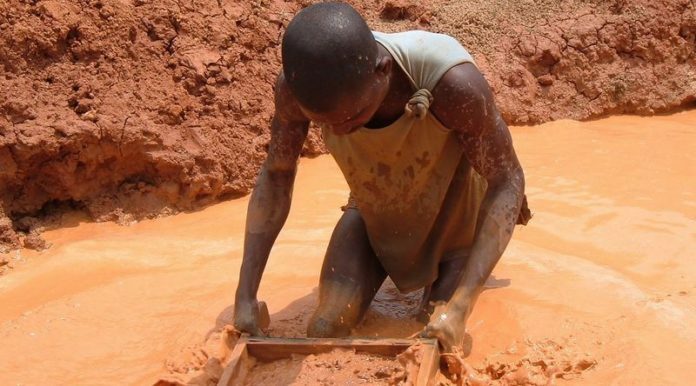 THE invasion of AngloGold Ashanti’s Obuasi mine in Ghana by artisanal miners would not be repeated, said Bloomberg News which cited assurances given by the African country’s president, Nana Akufo-Addo. Speaking at a ceremony that marked the re-opening of the century-old mine, Akufo-Addo said that the “… forceful encroachment on the concession of the company” was over. “The sequence of events that led to the closure of the mine will not recur under the watch of this government,” he added. Order was only restored at Obuasi by the Ghanaian government nearly a year after 12,000 artisanal miners first invaded the property in 2016. During that time, the gold miner sought legal action from the International Court of Arbitration. The re-development of Obuasi, which will represent investment of $450m to $500m in the initial stages is a key component of AngloGold Ashanti’s strategy. The mine was curtailed in 2014 after a prolonged period of heavy losses. Obuasi would deliver its first gold by the end of the year, AngloGold has said. Output in the first 10 years will average 350,000 ounces to 450,000 oz per year, it said. Total cash costs for the project are expected to average $590 to $680 an ounce, it said.